President Trump meets with North Korean leader in Hanoi, the first time the two met since historic summit in June 2018. President Donald Trump and North Korean leader Kim Jong Un met in Hanoi Wednesday for their first face-to-face meeting since the historic June 2018 summit in Singapore. Last June the two leaders met at the Capella Resort in Sentosa, Singapore, the first time a sitting American president met with a ruler of North Korea. At the summit, the two leaders signed a memorandum of understanding, vowing to continue talks for the termination of North Korea’s nuclear weapons program, with the ultimate goal of formally ending the state of war between North and South Korea and normalizing relations between the US and Pyongyang. Trump and Kim Jong Un held their second face-to-face meeting at the Metropole Hotel in Hanoi, and are expected to have dinner together Wednesday night. 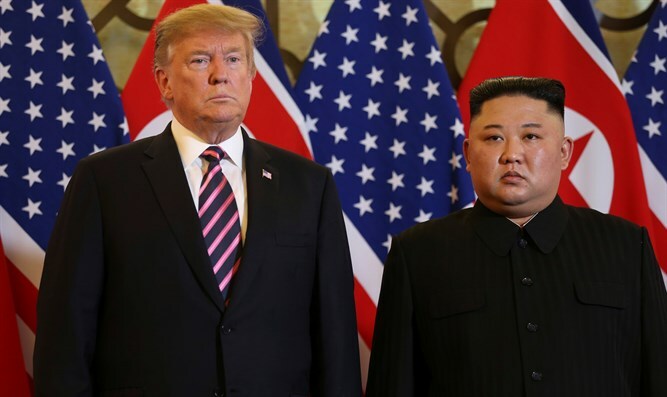 The American president expressed optimism regarding the prospects for major progress during the second summit, telling reporters during a joint press conference with the North Korean leader that he saw the first meeting as a “great success” which could be continued in Hanoi. Following the brief meeting, Trump and Kim will meet again Wednesday for dinner before a second round of meetings Thursday, during which more substantive talks are expected to take place on issues ranging from North Korea’s commitment to end its nuclear weapons program to the possible easing of sanctions on the rogue regime. After Thursday’s meetings, the two leaders are expected to hold another press conference, summing up their talks in Vietnam.